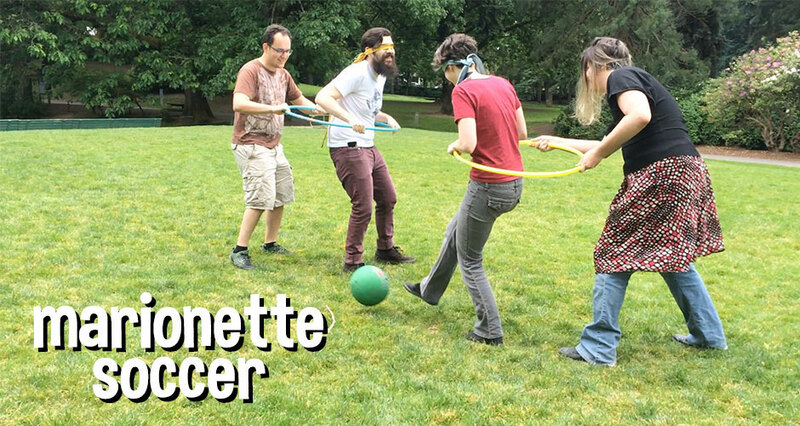 Soccer, but with more blindfolds, hula hoops and chaos! One player stands inside a hula hoop, wearing a blindfold. Another player stands behind them, outside of the hoop, and uses it to steer the blindfolded player toward the ball. Together, they must try and get the ball into a goal area without speaking to each other; only the player inside the hoop may kick the ball. There’s a lot of comedic flailing in Marionette Soccer, and it’s a silly, often-exhilarating experience for the players inside and outside of the hoops. Laura E. Hall, Seanna Musgrave, Josh Schonstal, and Yori Kvitchko are Portland-based artists and game designers who love to create digital and physical games.